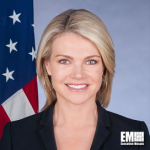 Heather Nauert, a spokesperson for the State Department, reportedly held a meeting to talk about the recent leaks at the agency, Axios reported Thursday. A source familiar with the public affairs meeting said those leaks involved the release of an article about the plan to retain Brett McGurk, a special envoy appointed under the Obama administration, for another six months and a news story on Palestinian funding. “The unauthorized release of information, whether it’s classified or not, is always a concern of the State Department,” Nauert told Axios. “It can jeopardize ongoing operations and negotiations in which the State Department is involved,” she added.